Roberta and I decided to head out for a motorcycle ride on the 4th. 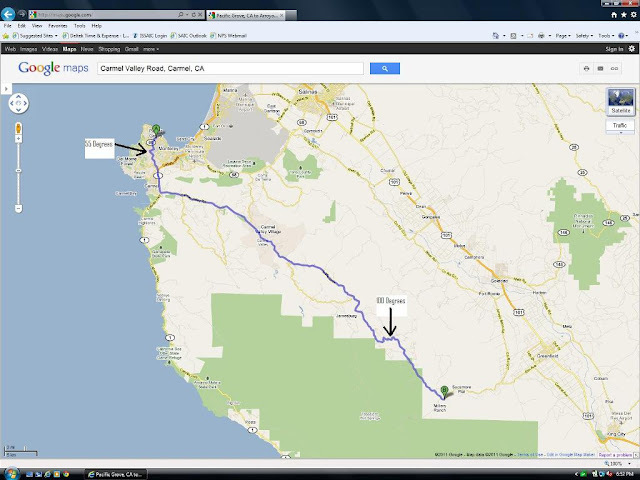 We ended up riding through Carmel Valley towards Greenfield. (We actually got within 8 miles of Greenfield before turning around and coming back). What’s interesting is the change in temperature between our start point and the top of the hills inland. 59 degree starting temp up to 100 degrees and then back to 55 degrees coming home. It was foggy and cold in Pacific Grove when we left, then we got out of the fog and into the California sunshine up in the hills. Coming home was the reverse, we left the sun and hit the cold fog of the coast. Kind of hard to dress for those kinds of changes in only 40 miles. My bike has an air intake temperature sensor, so I can get a fairly accurate reading of temps as we ride. This picture is from about 10 miles past Carmel Valley Village out in the hills. And this one is just a few miles farther along the road. It’s was pretty interesting how quickly the terrain changed. Here’s the bike while we were taking a break near one of the creeks we passed. We didn’t stay there all that long, with the cooler temps, water, and shade the flies and mosquitoes were pretty bad. It was a pretty nice ride. We didn’t push it that hard, just out having fun. What’s interesting is how much of the tires we used “just” cruising around. We stopped for some water in Carmel Valley Village on the way back and I noticed the wear pattern on the new back tire. The shiny part is because the tire is only a week old and the protective coating hasn’t all been worn off yet. As you can see, we used about 90% of the tire on the trip, taking it easy. Can you imaging if we were riding hard? Talk about an easy leaning bike. For those who would rather ride than tour the castle there is an optional out–back from camp on a quiet country road winding up into the empty hills. Scenery along the way varies from rolling oak-dotted hills to fields of lettuce and chili peppers to remote canyons filled with wildflowers and sleepy little creeks. Travel..to and from………………The tour begins in Monterey just over two hours from San Francisco.